What traits are common to the best global sites? What are the most popular languages across all sites? How are companies promoting their Facebook and Twitter pages around the world? What sites offer the best global gateways? What are the best web sites that support fewer than 10 languages? This report, published annually since 2002, answers these questions and many more. You’ll learn exactly which companies are improving at web globalization — and why. Through detailed website profiles, loaded with screen shots, you'll learn which practices to emulate and which to ignore. An entire section is devoted to the top 20 best practices and top 10 emerging trends in web globalization. Founded in 2000, Byte Level Research was the first firm dedicated exclusively to the art and science of web globalization. We have consulted with hundreds of multinationals and have learned what works and what doesn't work and, just as important, where their websites are headed. This expertise is carried over into the methodology of the Report Card, the first report dedicated to best practices in web globalization. We conduct a hands-on analysis of the world's leading websites, analyzing how web designs are shared across countries and mobile platforms, noting languages used on every website, studying local content, social media, and navigation. This information, along with nearly a decade of historical data, will help you benchmark your company against competitive and “best of breed” sites such as Google, Facebook, Amazon, and Hotels.com. A combination of quantitative data and practical, hands-on advice make this report an invaluable resource for any company doing business across borders. Marketing executives use this report to improve the effectiveness and usability of their global websites. The numerous screen shots included in the report clearly illustrate trends and best practices. The report points out flaws in many of the world's most popular websites — and, more important, makes clear suggestions for improvement. Web and IT executives use this report to learn best practices and drive changes within their companies based on concrete data. For example, knowing exactly which companies are now using geolocation can help raise awareness and get management buy-in. No other report will tell you exactly which companies are using geolocation right now and which companies are using language detection. Web design firms and advertising agencies rely on this report to upgrade their web globalization skills. This report's accessibility and its wide range of real-world examples makes complex concepts more easily understood. If you would like to purchase this report please email us. Google, which has held the number one spot for years, was unseated by Facebook this year. Facebook’s recent innovations (multilingual social plugins, improved global gateway, multilingual user profiles) gave it the edge. Companies like Cisco, 3M, Philips, and NIVEA have become regular faces in the top 25. But there are some new faces as well. There are five companies new this year to the top 25: Volkswagen, Adobe, Shell, Skype, and DHL. Although these 25 web sites represent a wide range of industries, they all share a high degree of global consistency and impressive support for languages. They average 58 languages -- which is more than twice the average for all 250 sites reviewed. Report author John Yunker reviews every website — and has done so for all 10 editions of the report. No work is outsourced. This historical understanding of each website (combined with one-on-one interviews with many of the executives who manage these global websites) provides valuable and actionable findings and recommendations. How do you select companies for your list? We survey a wide swath of global companies across all major industries to provide a well-rounded overview of the state of web globalization. Within each industry, we include the leading companies with a focus on brand leadership. We include more than 30% of the Fortune 100 companies and 70% of the 2011 Interbrand 100 Best Global Brands. What’s the value of comparing companies across different industries? Web globalization best practices may emerge in any industry. By keeping a broad focus on all major industries, we are able to point executives to those companies and industries that are doing the best job of presenting themselves to the world. Every company included does have peers by which it can be evaluated. In the end, our goal is to provide a truly global perspective on which companies and industries are the most active and successful in web globalization. Only through casting a wide net do we achieve this goal. What companies purchase this report? Many of the companies benchmarked within this report have purchased the report for multiple years. Purchasers include Cisco Systems, Deloitte, Panasonic, FedEx, Philips, The World Bank, and Yahoo! There are companies not included in this report that also use it regularly, such as global consulting and IT firms and various government agencies. Do companies pay to be included in this report? Absolutely not. We have never and will never accept money in return for inclusion within the report. Some of our consulting clients over the years have been included in one or more reports and we have used our methodology to help drive positive change within these organizations. That said, we take pride in creating a report that is self-funded and completely independent in focus, content, and findings. Global Reach (Languages): The website supports enough languages to reach a wide global audience. To receive a maximum score, the website must support 43 languages. Global Navigation: Web users can quickly and easily find their localized content, regardless of what language they speak. Global/Mobile Architecture: The website leverages global templates to support global branding while still allowing room for local customization. The website is also accessible via mobile devices, and language parity is maintained with the PC website. Responsive websites and mobile apps are also noted. Localization & Social: The website is relevant to the user's locale and culture and provides functionality on par with the global website. Local-language social media are also supported and well promoted on the local websites. John Yunker has helped a wide range of Fortune 500 companies improve their global websites and application. He has experience consulting with some of the world's largest companies and has also worked as senior program manager at Microsoft. He authored the first book devoted to the emerging field of web globalization, Beyond Borders: Web Globalization Strategies as well as the newest, Think Outside the Country.. John speaks at numerous industry events, including Localization World, Internet Retailer, and the Unicode Conference and has been quoted on global topics in publications including The Wall Street Journal and The New York Times. He is also editor of the popular web globalization blog Global by Design. 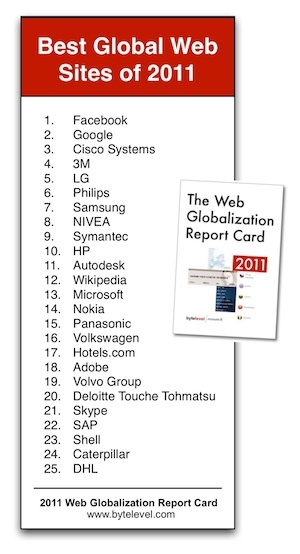 The Web Globalization Report Card is a copyright of Byte Level Research LLC. Trademark pending.